Insurance Setup screen has multiple functionalities. 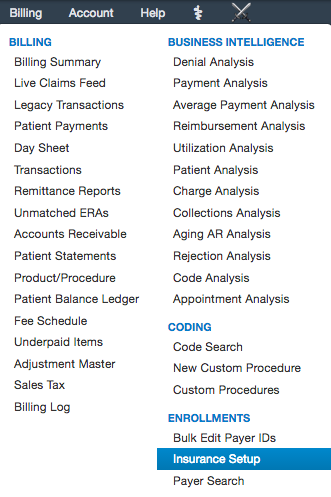 This is the screen where the doctors update all the insurances that they are billing out for their practice. Let's look down the different fields/options available in this screen. 2. This screen will display all the insurances which you are billing along with the billing information (NPI, Tax ID, Organization Name etc..) which you have updated in the Account > Account Settings > Billing Tab. 3. The fields that are available works based on each insurance. To edit or update any information, click on the pencil icon corresponding to the payer that you want to make changes. Billing NPI - If you have two NPI's (Group and Individual), you can switch between the two depending on how you are credentialed with the payer. This will reflect in HCFA box 33a. Eligibility NPI - If you get an eligibility error message regarding enrollment, you can switch the NPI depending on how you credentialed with the payer for eligibility. Provider name - Select the provider/practice name and this information reflects in the Box 33. Example: Select "Provider Name" if the billing NPI is individual. Tax id number - If you are billing the claims using the SSN#/Tax ID, you can switch between the two depending on how you are credentialed with the payer. Group Provider # - If the insurance is requesting the group provider number in the box 33b (Shaded column), please enter the group provider number in this field and choose the " Group provider number qualifier". Example: Indicate whether it is Taxonomy, State License, Provider UPIN#. Individual Provider # - If the insurance is requesting the individual provider number in the box 24j (Shaded column), please enter the individual provider number in this field and choose the "Individual provider number qualifier". Balance billing - If you are out of network with the payer and would like to bill the patient for any adjustment, choose the option as "YES". 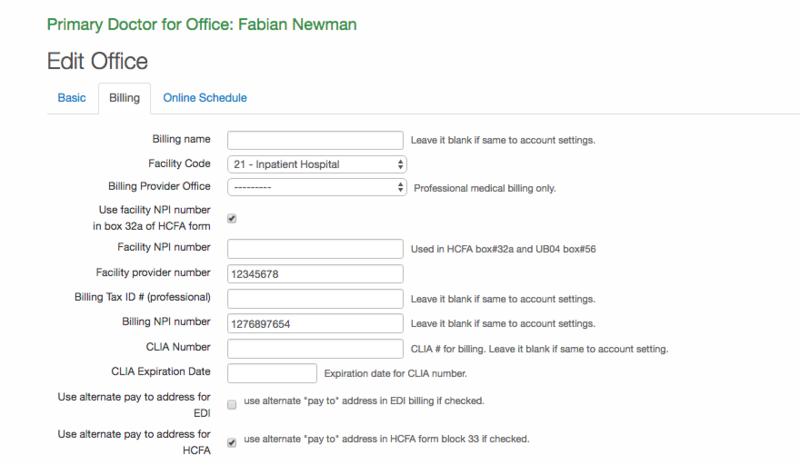 This will transfer the adjustment amount towards the patient column. Filing limit days - If you know the Timely filing limit for the payers, update in this field. You can retrieve a claim report in the Billing > Live Claims Feed by placing a check mark on the box "TFL Warning". Accept assignment - If you uncheck this option, the insurance will send the payments directly to the patient and not to the doctor. Send facility provider number - This number populates from the Account > Offices > Edit > Billing > Facility Provider Number field. It will reflect in HCFA box 32b (Shaded field). Referring doctor/Ordering doctor - If you want a specific Referring/Ordering provider to reflect for all the patients who have this particular payer, enter the doctors name which will populate in this field. You would first add the doctors information to the Message center as a contact. Print license numbers in HCFA - This number populates from Account > Account Settings > eRx Info > State License Number field. This will reflect in HCFA boxes 24j (shaded area) and 31.